I tend to be quite derisive of that genre known as “chick-lit”. The term chick-lit itself does the genre no favours, and there is a lot of rubbish under that heading. I find most of it clichéd, sappy and poorly written. Yet there are some authors and novels which are worth reading, and so I occasionally give in to my urge for an easy, thoughtless read in the hope of finding something good. After all, we all love a happy ending, and you’re almost guaranteed that with chick-lit. I had no hopes for Lindsey Kelk’s I Heart series. I got the first book, I Heart New York, free with a magazine, which never bodes well. Plus the title is awful. But then I read it, and the following two novels. Despite my irritation with the main character stating that at 26 she was “past it” (which is just a ridiculously unrealistic attitude), I wanted to continue with the story. 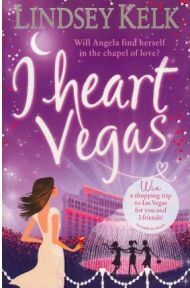 And when I came across book four, I Heart Vegas, in the Kindle post-Christmas sale, I eagerly downloaded it. At that point, I thought it was time to admit that I like the series. In many ways Angela is a typical chick-lit heroine. She has a weakness for shopping, drinks with her girlfriends and gets herself into all sorts of messes. I found her attitude to her age in I Heart New York really irritating, as I already mentioned (since when has 26 been considered old?? ), yet there is something endearing about her, and especially in her relationship with the lovely Alex, that just makes me want everything to work out for her. While simultaneously wanting to slap her for being an idiot. Generally speaking, chick-lit is about love and finding The One – almost all novels in this genre feature women trying to find the perfect relationship. So the male lead plays an important part – we, the readers, need to like him so we can cheer when everything works out. Lindsey Kelk is right on the money with Alex Reid, Angela’s boyfriend. He’s gorgeous, sweet , loving and cool, and you always want them to work things out. In I Heart Vegas, I found myself well and truly on Alex’s side after Angela made a mess of things yet again, which is unusual. You expect to be backing the girl – but Angela made a monumentally idiotic decision, and went about it in all the wrong ways, that I was definitely with Alex on his reaction to it. The action of I Heart Vegas centres on the trip to Las Vegas, but there is plenty in New York too. I enjoyed the New York sections more, as there is something magical about the city. Like the characters, I found the trip to Vegas an interlude to the normal “real life” of the story, where everything went a bit mad. No Comments on "I Heart Vegas"